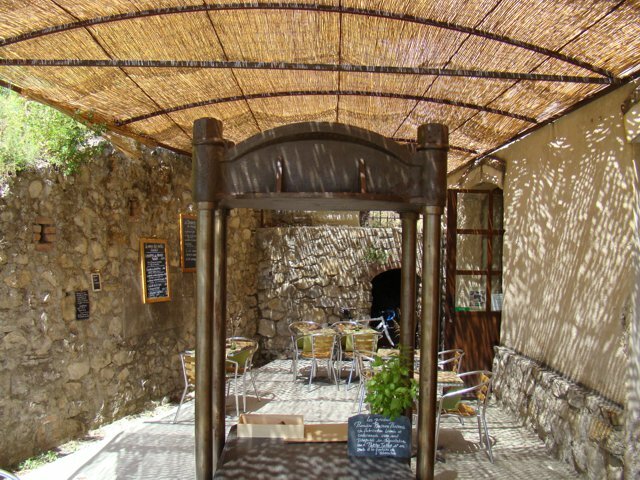 In mid-July in Provence the heat can be pretty tough. If you’ve ever wondered where everyone is in the afternoon and why all the shutters of the houses are closed, the reason is simple, the heat. Air conditioning is a rare luxury in France and so the technique of opening the windows at night and closing them in the early morning guarantees a cool house for the rest of the day, and it works fine. The other dilemma in mid-summer is eating out at lunch time. If you indulge yourself in lavish menus and copious amounts of wine then your afternoon will be spent snoring under one of the many plane trees of Provence. This is a perfectly acceptable option once in a while, but if you want to make the most of your day then light, healthy and easy to digest options are what you are looking for. As it happens I have just finished lunch in one such place, and have no desire to sleep under a tree or on the lovely leather sofa in my office. 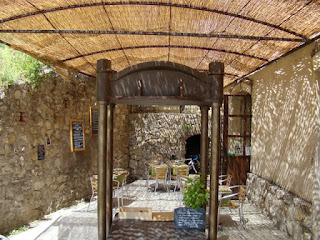 Today I had lunch at Les Petites Tables at the Eco Musée de L’Olivier in Volx, Haute Provence. 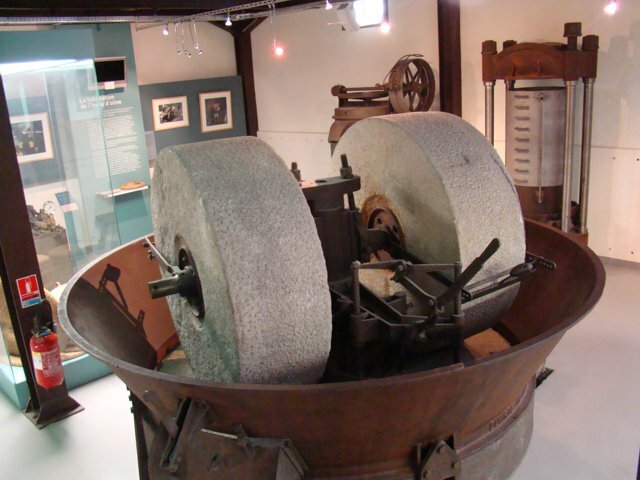 The Eco Musée is a fascinating museum on the culture of the Olive tree throughout the ages, and was created by Olivier Baussan who is also the man who created L’Occitane en Provence. 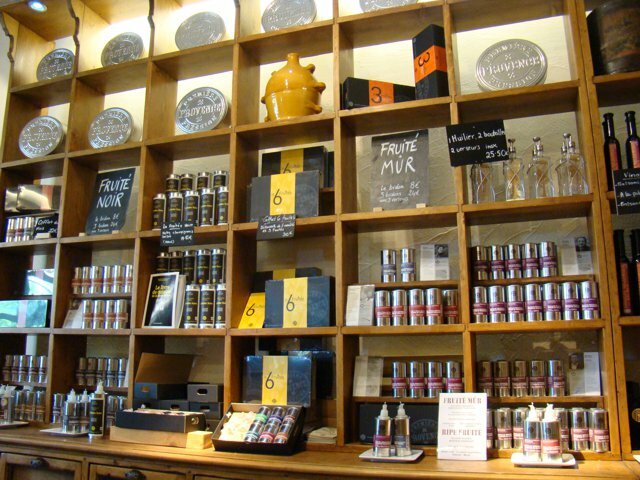 Alongside the museum is a shop selling an incredible range of olive oils from across Provence, each one being personally selected by Olivier himself. 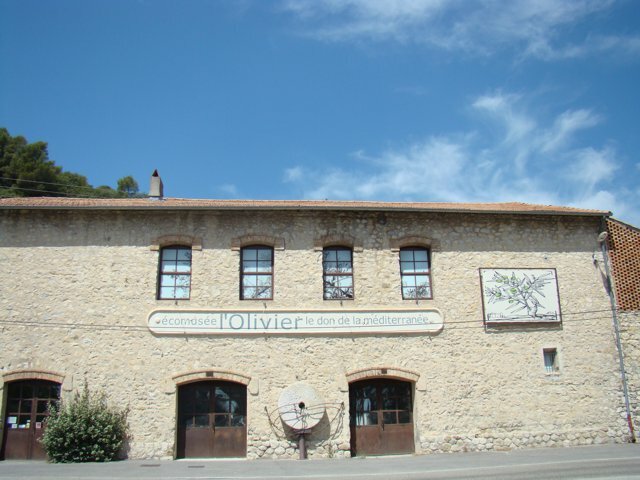 You can also find produce ranging from locally made terrines to tapenades, flavoured salts, dried Provençale tomatoes, porcini flavoured pasta and even sardines from Port St Louis du Rhone and all of these are made by personal acquaintances of Olivier. Soon you will even be able to book a weekend or a holiday through one of the best in the business, and meet some of the olive oil producers, and manufacturers of the countless delights on offer here. (All this coming soon) The travel agent creating the travel experiences with Olivier Baussan is me of course, though I assume you thought it couldn’t be anyone else! 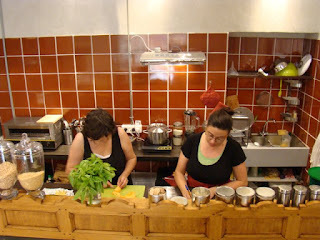 Josephine and Virginie hard at work in the tiny kitchen. 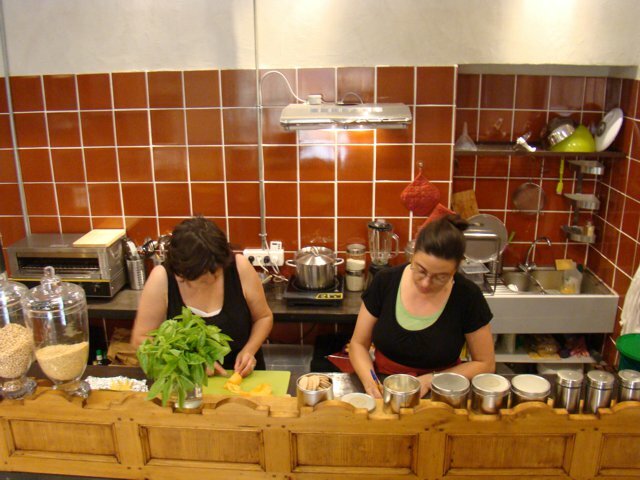 This little restaurant is run by Virginie and Josephine, from a tiny kitchen which is in the inside dining area. 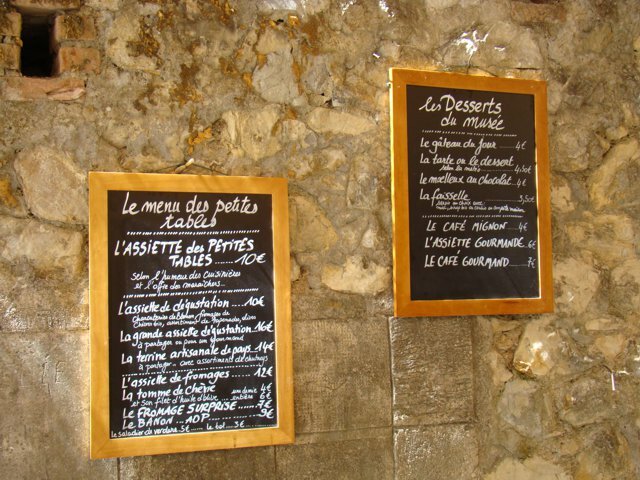 The principal is simple, each day Virginie creates salads, tarts, soups and cakes. 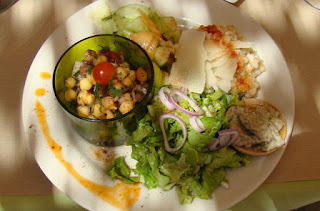 You can choose to have the selection of the day for a mere 10€, which today was a risotto d’épautre (épautre translates as small spelt, a type of wheat, locally grown) a chick pea salad, a cucumber and melon salad, an eggplant caviar with cumin, a chilled courgette and coriander soup and green salad with shallots. That’s quite a selection for such a small price tag and it was utterly delicious, copious without being too much and best of all you know that everything was prepared on the day, using exclusively local produce. Now I can hear some of you are saying to yourselves, that’s a great meal if you’re a vegetarian or a rabbit. You would of course have a point, although rabbits would never go for the eggplant caviar, or the soup. 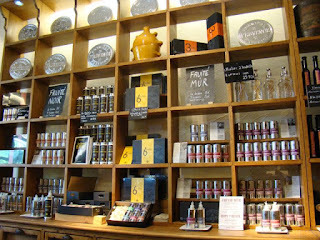 But Virginie and Josephine have the answer, as they also have on offer a wonderful selection of charcuterie, including dried hams, terrines, tapenades and local goats cheese (made by my good friend Thierry Yernaux*) also all locally produced. I was eating with a friend and we decided to take one selection of the day and the charcuterie to share, which was the perfect combination. You can also ask to have half and half on a plate as they are both the same price, 10€. For dessert I took a café gourmand, which is an espresso coffee with a selection of small portions of different desserts. 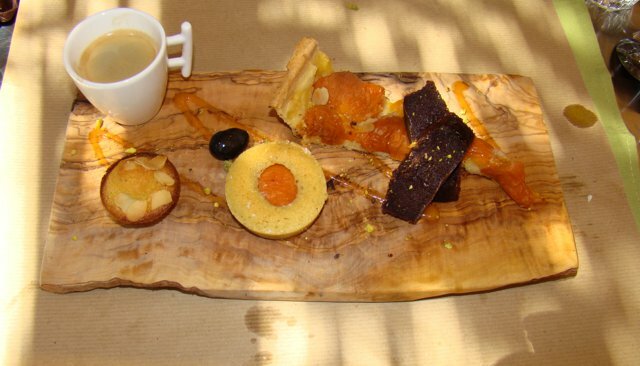 It’s what you take to make you feel that you are not over indulging by having dessert and then a coffee, but the reality is you are, and often there is more on the plate of a café gourmand! Now I have several criteria for judging chefs, and one of them is desserts. Based on that, Virginie is a great chef! The selection I had was a slice of apricot tart, with melt in the mouth pastry, an almond and apricot cake, another little cup cake and two slices of a chocolate cake that was so smooth and moist and rich that I’m glad and yet sad that there was not more. The café gourmand was priced at 7€. All in all our meal came to 17€ each and on top of that we half a bottle of chilled rosé wine (necessary in summer) for 5.50€. For the quality and freshness of the produce and the culinary skills that transformed it I think it’s hard to find a better deal in the height of summer in Provence, or anywhere else for that matter. So when you are traveling in La Haute Provence, come and visit the Eco Musée de L’Olivier, browse the shop for some fantastic genuine souvenirs and gifts, and take a seat at Les Petites Tables for lunch, assuring you a delicious break in your day’s discoveries at a very reasonable price, and the possibility to continue on in the afternoon without needing a nap.